Play 50 Wild Draw Four Cards! Challenge another player's Missed UNO 25 times! Achieve Level 25 in UNO & Friends! Be the UNO! Level 50! Achieve Level 50 in UNO & Friends! Achieve Level 100 in UNO & Friends! Change the color to Green 5 times with a Wild Card! I See Cards of Blue! Change the color to Blue 5 times with a Wild Card! Change the color to Yellow 20 times with a Wild Card! Give 5 gifts while playing a game of UNO! 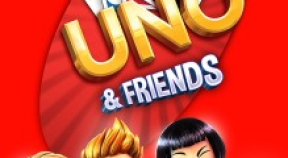 Invite 5 Friends to play UNO & Friends! Change the color to Red 20 times with a Wild Card! Win two UNO games in a row!